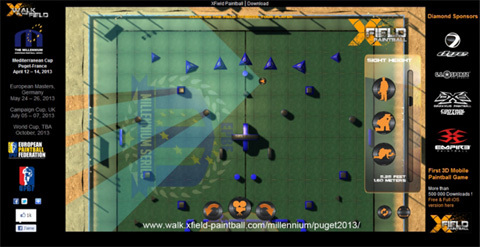 Press release PCB Game March, 29- 2013 – for immediate Release: Millennium's fields walk in your couch! 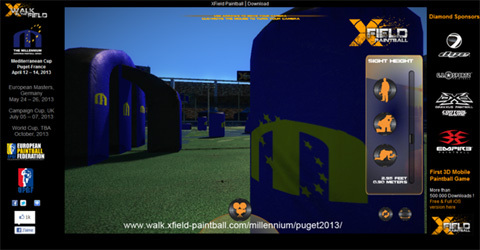 PCB Game, publisher of the first 3D Paintball game for mobiles and tablets "XField Paintball" provides an innovative free online service for 3D virtual field walk with Millennium 's official layouts. 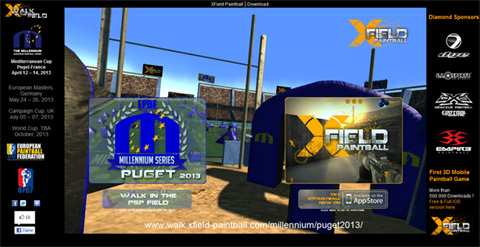 This new service is available now for Millennium series Mediterranean Cup which will be running at Puget Sur Argens from 12 to 14 April 2013. It is also possible to adjust the height of the camera view with an accuracy of centimeter. This has been possible thanks to the partnership with Sup'Air Ball, the company equipping all official competitions fieds. The application is usable in a web browser, only the installation of a small plug-in is required. Users must just download a small 3D scene (about 25 MB). There are different ways to approach each module: standing, crouching or crawling, height and angles for shooting automatically adapt. PCB Game and Millennium announce a partnership agreement that will allow publishing the 3D layouts from the day of their official publication.